BA (Hons) Music is divided into five named awards: music, composition, performance, ethnomusicology, and technology; allowing you to choose and develop your own areas of particular interest. Become a well-rounded musician on this inclusive honours course. Participate in a rich diversity of modules and develop as a creative, reflective practitioner and researcher. Graduate with a broad range of skills across a variety of pathways. Develop your own distinctive musical voice. Work with other practising composers and performers, who share their experience and working methods in critical discussion and analysis of a variety of musical works and compositional techniques. Expand your portfolio through creative engagement and interaction in lectures, seminars and workshops. Grow as an instrumental or vocal specialist with this strand’s focus on performance. Extend your range of playing styles, or stylistic variations. Benefit from one-to-one specialist tuition to develop your skills and interpretative understanding. Engage with musical performance in both theory and practice. Deepen your understanding of what it means to be a performer and your critical awareness of the surrounding culture and context. Ethnomusicology is a fusion of musicology and anthropology where you will gain hands-on experience in exploring various musical cultures through a blend of fun and engaging practical workshops as well as seminars. The seminars enhance your knowledge in understanding various pioneers/methodologies/theories/key texts (including fieldwork), and this provides an excellent foundation to your final dissertation project or future MA in Ethnomusicology or Anthropology. Over their three years of study, students are introduced to theory and applications of music technology. Our curriculum is designed to provide skills for working in the industry and provoke curiosity around contemporary practices in Computer Music. Students will learn how to a professionally record, mix, and master their music while also learning how to use the computer as an intelligent, creative collaborator. Thus, along with training on industry-standard software packages, students will be introduced to programming languages to liberate their creative practice. For example, previous students have developed computing systems for real-time improvisation and gesture recognition software for triggering sounds from the movement of dancers. 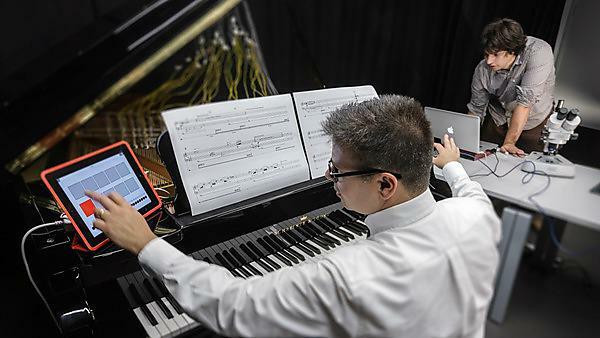 Learners will have the opportunity to have their use of computing technology assessed in live performances, notated compositions, audio recordings, installations, and as software. Cutting-edge research from the Interdisciplinary Centre for Computer Music Research (ICCMR) is embedded in a number of the programme's modules to ensure the course is at the frontiers of the field.